Are you looking for a vintage Martin guitar or Gibson guitar, a fine Gibson mandolin, or a good upright Kay bass? Perhaps other brands of vintage mandolins are your interest. We often have a Flatiron mandolin, Collings mandolin, or a Ratliff mandolin in stock, and occasionally a Summit, Nugget, Monteleone, and even a Loar F5 has been found here. Perhaps a Fender Stratocaster, Telecaster, or Jazzmaster is your thing. Or maybe you're a dedicated Gibson Les Paul or National Tricone or Duolian player. These and many other fine vintage stringed musical instruments can often be found on this web page. The selection changes frequently, and cool instruments arrive on a regular basis. Keep reading for great deals! The following is the current "for sale or trade" list. The camera icon means an image is available. Click on the instrument name or the small thumbnail picture beside it to see the full size picture. Additional digital photos are available for any item listed. I'm open to trades - what ya got? I'm especially interested in a good Martin guitar or a fine Gibson mandolin; will trade up, down, or sideways for these! As always, you have a 48 hour trial period on mail order sales of used or vintage instruments. See the details under "ordering". All instruments listed below are available for sale unless marked "on hold" in the description. Click here for a description of our "on hold" policy. PLEASE NOTE: We DO NOT ship rosewood guitars across international borders. No further details are available on these. I do not price instruments until they are ready for sale. Please keep watching the page for the listing! 1917 Gibson A4, Excellent plus condition, top of the line in A style for Gibson, completely original, plays easy, nice big sound. 1935 National Style N, Set up for slide, very cool and all original mandolin. Think Sam Bush! 1973 Ren Ferguson Dreadnaught Built before Ren joined Gibson, Brazilian rosewood, heavily bearclawed top. 1960s Plant Leaf Design Guitar Strap, Iconic 1960s design. Hint-what plant was popular in the 1960s? Please click on the name of the instrument or the camera icon beside it to see more details and larger pictures. If you would like additional images of a specific instrument please email your request. Click here to return to the home page for Mandolin World Headquarters...and Guitars! NOTE: If the listing shows "ON HOLD", there is a sale working on the instrument and it is NOT FOR SALE. Flatiron was started by Steve Carlson as "Back Porch Productions" in Bozeman, Montana in 1979. Bruce Weber was an early employee and built many of the mandolins. Their first mandolins were copies of the teens Gibson "Army-Navy" pancake mandolins. They later branched out into carved top instruments, and were building a superior mandolin to Gibson by the mid to late 1980s. In May of 1987 Gibson bought Flatiron and moved all mandolin production from Nashville to Bozeman. Mandolins were built in Bozeman until 1998, when Gibson moved all production back to Nashville. In 2000 Gibson discontinued the Flatiron line, and later revived the name to use for cheap souvenir mandolins at the Opry Mills Store in Nashville. 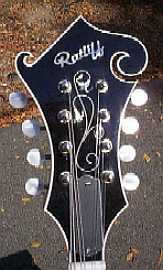 Current Flatiron mandolins are low quality Chinese imports. Although Flatiron was the "budget" line, since 1987 Gibson and Flatiron mandolins were built side by side in the plant by the same luthiers. Both are the same high build quality. There were some models of each that were identical and the only difference was the color of the finish and the name on the peghead. There are some basic differences in the upper end models. The top of the line Gibsons were always tone bar braced, used traditional size fret wire and had the classic fingerboard extension. The Flatiron top of the line Master and Artist mandolins were X braced, which many pickers think gives a more percussive chop. They also had abbreviated fingerboard extensions, had a radiused fretboard and used larger fret wire. 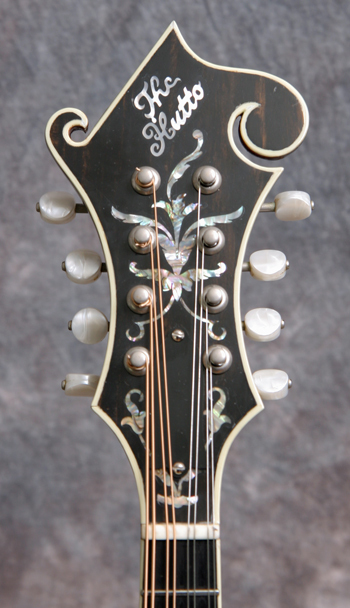 The pre-Gibson carved top Flatirons are considered some of the best post war mandolins made. The Bozeman era Gibson and Flatiron mandolins are excellent bluegrass instruments. Audey Ratliff runs a one-man shop making mandolins in east Tennessee. At one time he had a small production shop with assistants, but he found that the way to insure high quality workmanship and good sound was just to do it himself. He has now concentrated his efforts on building the finest F5 style bluegrass mandolin available. The mandolins sound better than ever...the bad news is that they're getting harder and harder to get. Audey may make the best bluegrass mandolin on the planet for under $5000...we invite you to be the judge. ELECTRIC MANDOLINS For a brief discussion of Tiny Moore, Johnny Gimble and the Gibson EM-150 mandolin click here! (Serial No. 1930026) Mint unplayed condition. Straight grained Madagascar rosewood back and sides with master grade Adirondak red spruce top. The OM-28 Authentic 1931 has the Martin 14-fret neck Orchestra model innovation with its lengthened 25.4 inch scale and 1 3/4 inch neck width. Madagascar rosewood back and sides and Adirondack spruce with the new Martin Vintage Tone System (VTS) are used to replicate the aged appearance and tonality of the 1931 original. All other appointments and processes, including hide glue construction, open back Waverly tuners, hand shaping and assembly, and tucked under bridge plate and bracing, are completely faithful to the original guitars. STEELS AND RESONATOR INSTRUMENTS For a good article on Weissenborn, Kona and similar Hawaiian slide guitars click here! Are you searching the flea markets and antique stores every weekend for looking for old or cool instruments? Are you looking for something decent to fix up and play? On a tight budget and don't mind a little sweat equity? Keep reading for great deals! I get a lot of instruments in. Some need work or have significant wear or finish issues. Many are projects that I just do not have the time to get started, let alone complete. A few I've just had for too long and they need to go on down the road. Some are just cool wall hangers. These instruments are sold as-is. There is no approval period. I might look at a trade if its not another project. I'm not interested in low ball offers on these, as most are priced at my cost. Assume that they need work to make them right. You do get a good deal on the price! All prices subject to change, up or down, without notice. All instruments are subject to prior sale. All instruments are sold as-is, with an approval period of 48 hours after receipt. For details click on "How to order" information above. Appraisals Click here for information on appraisals. I'm looking for O, OO, and OOO size Martins and Gibsons, also Gibson mandolins and mandolin parts. Please let me know what you have for sale. Cash or fair trades offered. Thanks! Keep in touch! Looking for something special, got one to sell, or just want to comment? Please read and sign my new guest book!